Located in the south of England, Brighton Table Tennis Club has been in the news several times this year for their amazing integration work in the local community. On Saturday 14th and Sunday 15th July, Sarah Hanffou, ITTF Foundation Ambassador and President of Ping Sans Frontières, visited the renowned seaside resort. Welcomed by Tim Holtam, Co-Founder and Director of the Brighton Table Tennis Club, the former African champion was invited to take part in an exhibition tournament. The event involved Pedro Santos, the club’s head coach alongside Mark Scutts, the leading player and Poland’s Karolina Pek, gold medallist in Women’s Team Class 6-10 at the Rio 2016 Paralympic Games. Sarah Hanffou emerged as winner after beating Pedro Santos and Mark Scutts in front of a local crowd. Thanks to the exhibition match, £100 was raised for the Clock Tower Sanctuary, the one and only voluntary centre for young homeless in Brighton. “Table tennis has this power to unite people and build bridges. The Brighton Table Tennis Club is the perfect example. 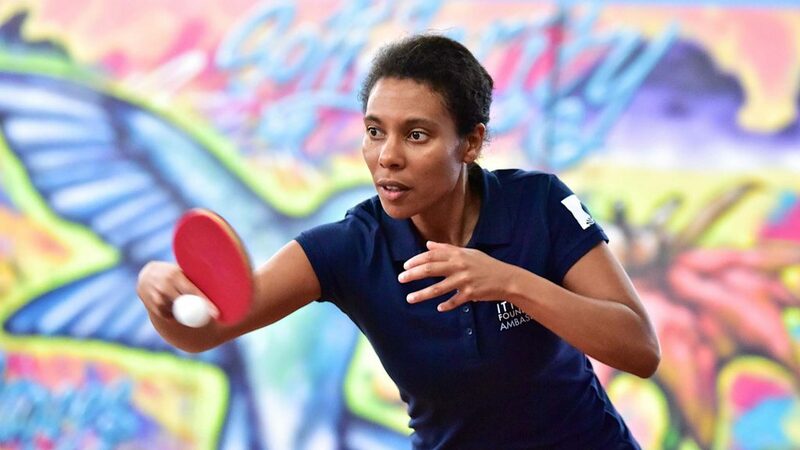 In short, that was a visit that perfectly illustrates the values of the Foundation: solidarity through table tennis!” Sarah Hanffou. In addition to the exhibition tournament, the Sarah Hanffou visited Her Majesty’s Prison High Down, where the club offers weekly sessions. She watched “Believe That”, a short documentary about the preparation of three players from Brighton Table Tennis Club who will represent their country at the European Down’s Syndrome Championships. Certainly Sarah Hanffou was a most welcome guest; no doubt she will return.